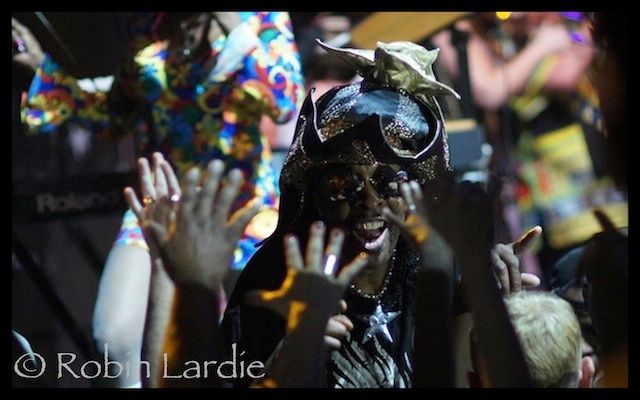 Last Sunday night, Austin hosted Rock n Roll Hall of Famer William "Bootsy" Collins and his all-star 13 piece band. And what a night it was! The evening started with Mrs. Patti Collins and the "Bootsy Girls" greeting the crowd and introducing some of her husbands students at "Funk University", his online bass instruction school.I’d guess by looking that the students were an average age of about 13 and they took a few of them spoke briefly to the audience about how much they had learned and are enjoying studying with the funk prodigy. The lights go dim, the crowd chants ""Boot…SAY"…"Boot…SAY" over and over, cue lights and large entourage of some of the most talented names in funk enter the stage from both the right and left. Thirteen in total including a head-to-toe purple sequined Bootsy, complete with matching top hat and large yellow plume attached. What followed was about three hours of undiluted funk. I’m told the Bootsy hasn’t landed his "mothership" here in Austin for over 15 years, and if that is a true statement I’d say he certainly made up for his absence. 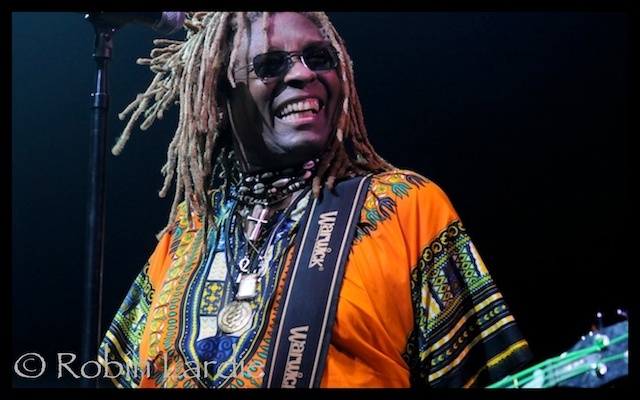 Guitarist Blackbyrd McKnight (Parliament Funkadelic 78-08) wailed a righteous funkified version of the "Star Spangled Banner" as well as "Purple Haze" that had the crowd fully engaged. Bernie “Dr. 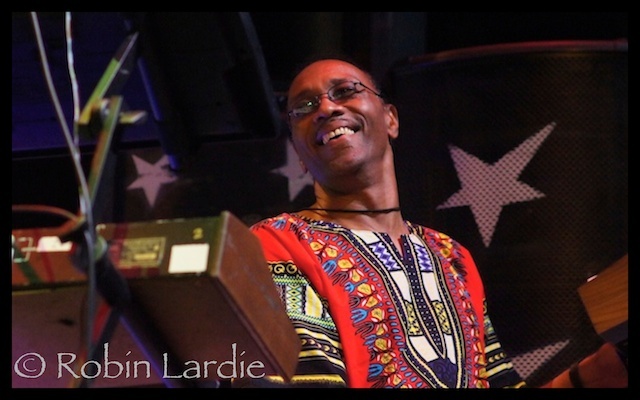 Woo” Worrell, also a former member of P-Funk, and RnR hall of fame inductee, and Razor Sharp Johnson (also of P-Funk) flanked each side of the stage with their huge keyboard rigs and kept the keys trippy all night. A sharply dressed Kyle Jason and the vocal powerhouse Razzberry White dueted on “Munchies For Your Love” and played off each other in a pleasantly surprising way. 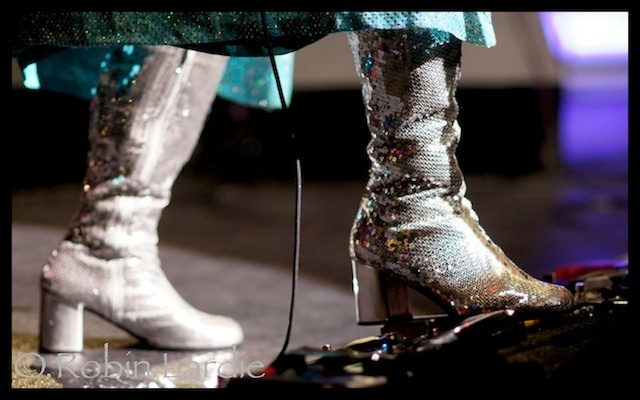 Presto chango and Mr. Collins is now wearing head-to toe TEAL sequins with his famous star-shaped bass, silver sequined boots and we’re no where near through. Bootsy indicated that the the crowd should cheer for the “Atomic Dog” and next thing you know the crowd is yelling “George Clinton” and BAM! straight into “Flash Light”. Now things are really wound up, and the hits kept coming. "What’s a Telephone Bill", "I’d Rather Be with You".Bootsy graciously shared the spotlight with the immensely talented and beautiful singer Candace Cheatham, the just as funky bassist TM Stevens and the horns! Oh the horns! Gary Winters, Randy Villars and Sarah Morrow rocked stage right right consistently and swingingly all night long. Time for one more costume change and our hero now emerges in a silver sequined cape with Casper (The Friendly Ghost) on the front and his star-shaped silver mirrored shades. 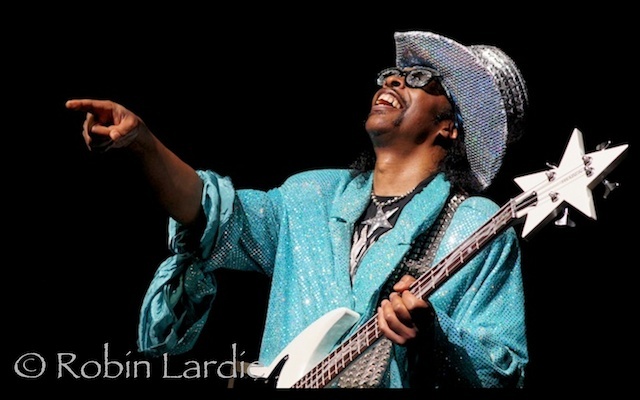 Just when we thought it was time to call it a night, Bootsy informs that crowd that he wants to sing to them from the concert floor but security had advised against it for safety reasons. He informs the audience “I told them Austin IS my security” and with that he was down and dirty with the crowd for the rest of the number. Three hours from show start the performance had finally wound down, and Austin’s sweaty masses started to drag their tired bodies home. I for one, can’t wait to do it again. And in case you’re wondering-the name’s STILL Bootsy, Baby!